Canadian food is a cuisine I haven't really explored, except for the poutine (being a fries lover, it seemed disrespectful not to have poutine if it's available). 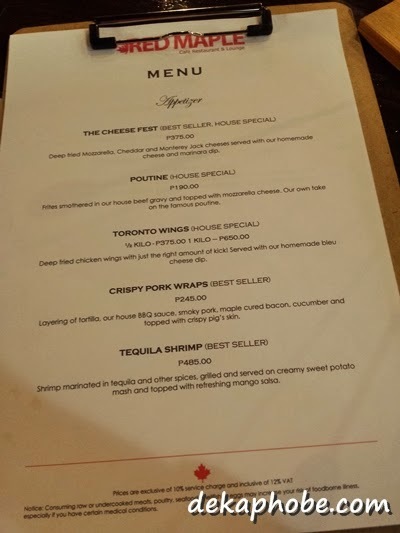 Fortunately for me, there's a newly-opened bar and lounge near my workplace that serves Canadian dishes: meet Red Maple. Located at the second floor of the building, this well-lit place is easy to spot from afar albeit the missing restaurant sign. The huge Canadian flag is not difficult to see though. While waiting for our food, we were served complimentary potato crisps. We were served our appetizer, the Poutine (Php 190). 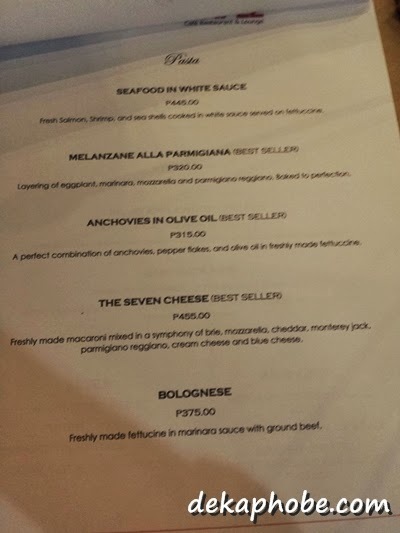 For pasta, we shared Anchovies in Olive Oil (Php 315). It is fettuccine with anchovies, pepper flakes and olive oil. It wasn't our first choice (which was unavailable) and thought it was worth the price. I was quite disappointed with it because the pasta was undercooked and the taste wasn't anything extraordinary. 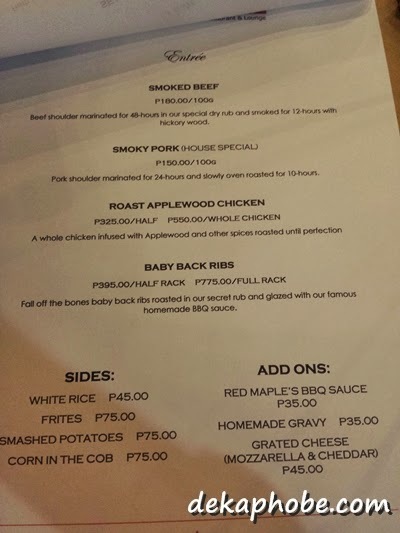 For entree, we ordered Smoked Beef (Php 180 per 100 grams) with Mashed Potato (Php 75). In case you are wondering, our 100-gram beef is more than enough for 2 persons if you order other dishes like we did. The Smoked Beef is marinated using their dry rub for 48 hours and smoked for 12 hours. The smokey flavor was glorious, and the tenderness was amazing, this could have been perfect if only they took it easy on the brine. The mashed potato, however, is worth the full attention. The creamy texture was impressive and the serving is huge for the price. Red Maple also offers a variety of local and imported beers and a wide variety of cocktail drinks. We were also offered some desserts which were on display. 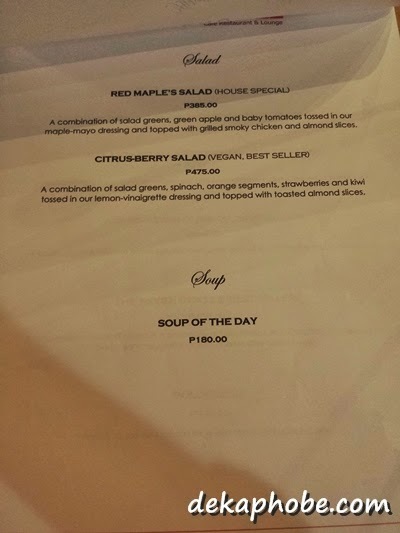 Though I was impressed with the quality of the service and liked the food (though it still needs some tweaking), I think Red Maple has to reconsider its pricing, as I find most of their dishes quite expensive. Still, I would love to go back to try their other best-sellers, like the Smoked Pork, Baby Back Ribs and the Toronto Wings.